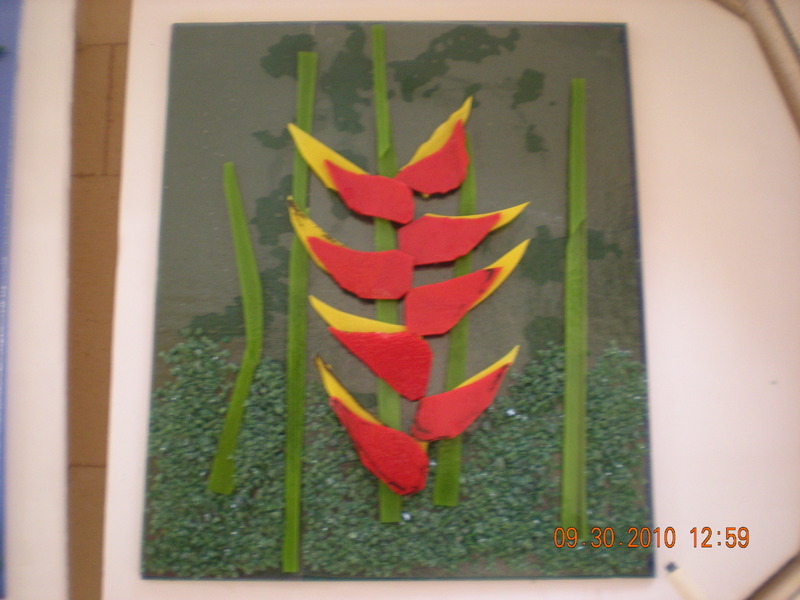 Figure 2…Heliconia Platter from Figure 1 fully fused and slumped into shape. 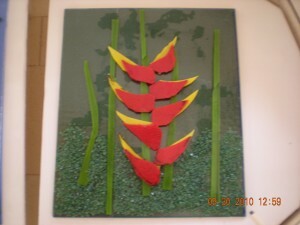 The Mosaic technique of developing a glass design is one where individual pieces of colored glass are cut into shapes and arranged to form the desired design. All such pieces are cut by hand. Typically the cut pieces are arranged on a base piece of glass that defines the shape of the final piece (rectangular, circular, etc). Figure 1 shows the initial assembly of what will ultimately be a rectangular platter with a Hawaiian heliconia blossom motif. The piece is put on a shelf in our fusing kiln and brought to a temperature of 1500 degrees F where the glass becomes molten and the pieces fuse together into a single piece. At this temperature, the glass pieces maintain their positions relative to one another…the glass colors do not mix to form composite colors as paints might. The molten glass, if unconstrained, will naturally want to be a quarter inch thick. Places in the design where glass pieces were stacked higher than a quarter inch will tend to spread. Places where it is less than a quarter inch will tend to contract. Knowledge of this is used in the design process. The firing process of reaching 1500 degrees is done in a controlled manner. The glass is first brought to 1260 degrees at a rate of 250 to 300 degrees per hour. (The kiln temperature sensor and computer permit this ability to control the firing.) The piece is held at this temperature for 30 to 60 minutes. This is called “bubble squeeze”. The glass deforms and squeezes out air that might be trapped between stacked pieces. After bubble squeeze, the kiln is brought to 1500 degrees F and held there for 15 to 30 minutes. This is where the glass actually fuses together to form a single piece. After fusing, the kiln is allowed to cool down to 900 degrees where it is held for 45 minutes to 3 hours depending on the size of the piece. The hold at 900 degrees is called the “annealing” phase. It is critical to the process because being held at this temperature allows for the thermal stresses in the glass piece to approach equilibrium so that when the piece is finally cooled to room temperature, it won’t spontaneously fracture. After the annealing phase, the temperature of the piece is brought down slowly to avoid thermal shock. 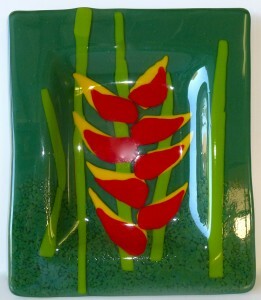 At room temperature, the piece can be removed from the kiln. The whole fusing process from putting the cut glass into the kiln to where one removes the piece from the kiln takes 24 hours. The pieces are flat at this point. Certain pieces are basically done as flat pieces such as cheese plates, clocks, and wall hangings, so they would theoretically be done at this point. The piece in Figure 1 intended to be a platter needs to be shaped. This requires an additional firing called “slumping”. 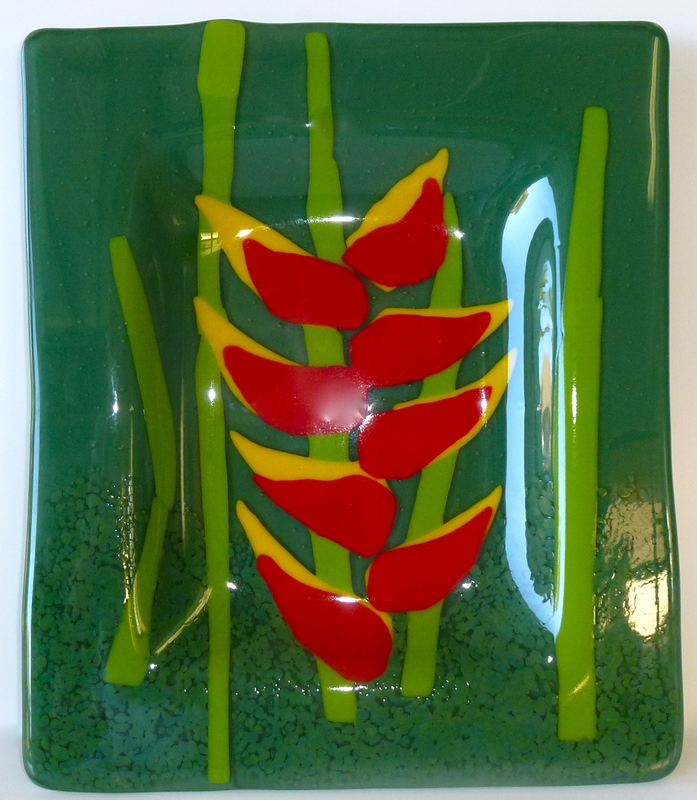 The flat fused piece is put on top of a mold in the kiln. The temperature is brought to about 1200 degrees F where the glass softens such that gravity causes the glass to take on the shape of the mold. The slumping process requires the same temperature control as fusing…controlled rise to 1200, a 15 minute hold, then cool down to 900 with a hold for annealing, and then slow cool down to room temperature. This again takes about 24 hours.Figure 2 shows the final shaped piece.